1 of 3 In a bowl, combine chicken, 2 cups of the spinach, the shallot, garlic, mustard, salt and 1/4 tsp of the pepper. Form into 4 patties. 2 of 3 Heat oil in a large nonstick skillet over medium heat. Cook burgers 6 minutes per side or until cooked through, adding cheese after flipping. (To help cheese melt, cover with a lid or tent loosely with aluminum foil.) Set burgers on a plate. 3 of 3 Add butter to skillet. Fry eggs 2 minutes, until cooked, and sprinkle with remaining 1/8 tsp pepper. 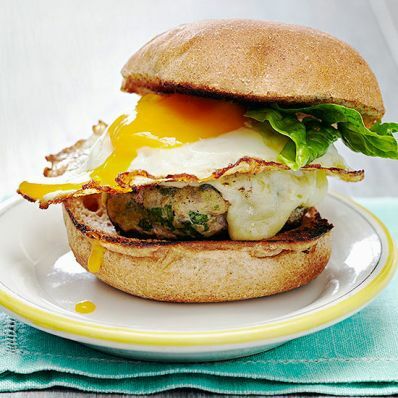 Top each burger with an egg. Add buns to pan cut side down; toast 1 minute. Transfer burgers to bottom halves of buns. Toss remaining 1 cup spinach with vinegar. Top each burger with some spinach and remaining bun halves.